Zack Shavin takes us to sites in New Jerusalem & Judea: Israel’s Knesset parliament, Great Menorah, Yad Vashem holocaust museum, Chagall windows, and drive through Judea in the footsteps of David and Goliath to the Elah Valley. Our last day in the Holy Land. We prayed Morning Prayer and drove around the new city: Ben Yehuda St. downtown, Prime Minister & President’s houses, Mea Shearim, where Ultra Orthodox Hassidic Jews live – seemed like our Amish dressed in black. Zack Shavin explained the Peyot: The side curls and how they remind us of the biblical commandment to leave the corners of the field for the poor to glean – doing Divine justice in the world. 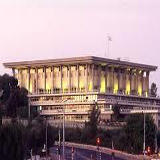 On to the government center:The Kenesset building (Parliament) – Zack talked about the political system, Great Menorah (Seven Branch Candelabra), national symbol of the Jewish people and Israel, proscribed by God in the Book of Exodus. 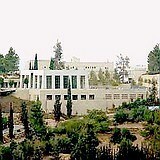 Nearby is the Israel Museum’s Shrine of the Book where the Dead Sea Scrolls are kept. We then drove to the Hadassah Hospital, to see the famed Chagall Windows of the 12 tribes – beautiful! On to the Elah Valley where our guide Zack Shavin showed us the place and river bed where David fought Goliath with five smooth stones in the battle with the Philistines – and then to tel Beth Shemesh and Sorek Valley where Samson grew up and met Delilah – and where the Ark of the Covenant was returned to Judea after the Philistines had captured it. Then Zack took us to his house for some home hospitality and we met his wife Elizabeth and their six children. Elizabeth made dinner for the group while the children gave us a piano concert before heading to the Ben Gurion airport. We thanked Zack and our driver with a gift – lots of feeling as we sang “Jerusalem, My Destiny”. 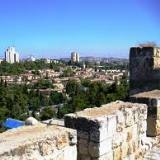 Have you enjoyed reading this Holy Land Pilgrimage Journal Day 9 about New Jerusalem sites? For more info about visiting Israel contact Zack Shavin, veteran guide & biblical archaeologist at Land of Israel Tours.